Do you find the puzzles fun to solve? How do they compare with the B&W version? Would you like to see Color Fill-a-Pix as mobile apps and online games? Note that the rules are slightly different from B&W Fill-a-Pix, and that ALL squares must be painted. Status: offline They look interesting and I would certainly like to try a few out to see how much they would appeal to me in practice. But the printable versions in your link aren't very useful for me. I'm fine with pencil and paper for some of your puzzles, like Slitherlink and Hashi. I'm even okay with it for the b&w fill-a-pix once in a while. But pencil and paper doesn't work well for me for other types, like link-a-pix or pic-a-pix, or really any puzzle where multiple colors are involved. For those puzzles, I only work them through your site. As such, while I can say that the concept seems intriguing, I can't really tell how much they will appeal to me without one to try through your site's interface. Status: offline WOW -- I like it! I can see the possibility of mobile mega puzzles on my tiny iPhone screen! Well, ok, I would like to see if moving the screen so often actually degrades enjoyment. I haven't played any puzzles on my iPhone in like forever. I think Color Fill-A-Pix will get my attention on any device. Status: offline The color FAPs were fun to solve. With the color clues overlapping each other it was definitely more of a challenge than the black and white ones. I'd like to see them online and on mobile. Status: offline I think that's a great idea! I can't really contribute to the discussion about the mobile app, because I only play on the computer, but I've been thinking about how a color FAP might work for awhile now, and I'd love to try it. Status: offline Not that it affects the concept, but I think there's a mistake in the example puzzles. In the last one, there's a black 4 that, in the solution, touches five black squares. It's the square ninth from the bottom and eighth from the right. I thought I'd just done something wrong at first, but I checked the solution and all five of those squares are supposed to be black. You may want to change that clue to a 5. Status: offline I'm not sure which puzzle you're referring to. The last puzzle on the samples page is the Mega Fill-a-Pix and the square you reference doesn't have a number in it. Status: offline Not the samples web page. 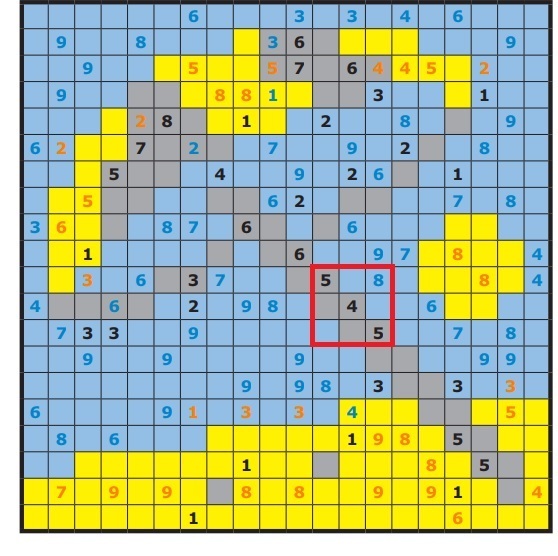 The example puzzles in the pdf that this entire thread is about. 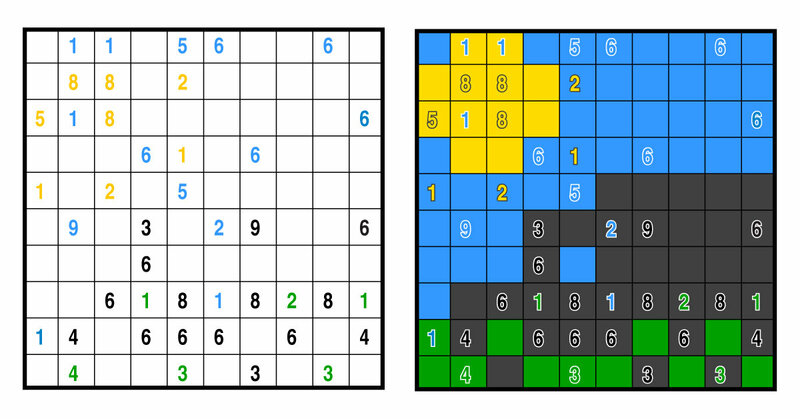 The example color FAP puzzles. The last one is called "05" and is a picture of a parasol. In the stem of the parasol, there is a diagonal string of black numbers, 5-4-5. But in fact, all THREE of those squares are touching five black squares. OK, the preview window doesn't show attachments, so I have no idea if that worked. Hopefully, this post will include a picture of the puzzle I'm talking about. Status: offline I'm not arguing that it doesn't. I love this idea, and I hope to see it introduced on the main site. I'm only annoyed because I found a mistake, pointed it out, and got precisely two responses - one from someone who clearly had no idea what I was talking about and one from someone who ignored my complaint completely. Even when I emailed the person who started the thread directly, all I got was an assurance that I was "welcome to post about it in the forum" and a half-hearted "I'll get someone else to look at it." I posted a picture and everything - even marked the square I was looking at. Anyone who could be bothered to spend 30 seconds on this thread, which apparently even the guy who started it can't, could see for themselves that there's an obvious error, but nobody cares! Status: offline I think it is more that nobody (at Conceptis) cares about these forums than it is about them not caring about the error. I recently had a problem with my account that stemmed from a problem with these forums. While they were fixing my account, I was also informed that Conceptis is planning to get rid of these forums entirely. I think it is more that nobody (at Conceptis) cares about these forums than it is about them not caring about the error. I recently had a problem with my account that stemmed from a problem with these forums. While they were fixing my account, I was also informed that Conceptis is planning to get rid of these forums entirely. Well, it doesn't seem to have much traffic in the forums, but I would definitely miss someplace to get help when I'm stuck. Though, having just read through half a dozen new posts with every one but yours being spam spam spam, I can kind of understand why they might be ready to get rid of these forums. I'm not arguing that it doesn't. I love this idea, and I hope to see it introduced on the main site. I'm only annoyed because I found a mistake, pointed it out, and got precisely two responses - one from someone who clearly had no idea what I was talking about and one from someone who ignored my complaint completely. Even when I emailed the person who started the thread directly, all I got was an assurance that I was "welcome to post about it in the forum" and a half-hearted "I'll get someone else to look at it." I posted a picture and everything - even marked the square I was looking at. Anyone who could be bothered to spend 30 seconds on this thread, which apparently even the guy who started it can't, could see for themselves that there's an obvious error, but nobody cares! If you had e-mailed Dave Green, the owner of Conceptis, he would have definitely responded to you through e-mail as he has responded to every single one of my e-mails. In terms of these forums, I find them hardly useful and that stems from the fact that there is no traffic on the forums at all. I don't think that these forums are worth keeping, and would recommend anyone that has any issues with any puzzles to contact people like Ahlyis or myself directly through e-mail. I would have to say that I am less experienced at most of the puzzles than Ahlyis would be, but I could still possibly help out in certain situations. ...recommend anyone that has any issues with any puzzles to contact people like Ahlyis or myself directly through e-mail. I would have to say that I am less experienced at most of the puzzles than Ahlyis would be, but I could still possibly help out in certain situations. If anyone wants to email me directly, I'm fine with that. Just send to ahlyis(at)hotmail(dot)com. There are others here, like Charlene, who are usually quite helpful any time someone posts a puzzle they are stuck on. Some of them may be willing to help via email as well. Status: offline I am able to help anyone with questions regarding Pic-a-Pix, Link-a-Pix, Block-A-Pix, Fill-a-Pix (Basic Logic only), Sym-a-Pix (Basic Logic only), Sudoku (Everything but Diagonal and Odd/Even), Hitori, Slitherlink, Battleships, Hashi, Nurikabe, and Tic-Tac-Logic. For Slitherlink, Hashi, Nurikabe, and Tic-Tac-Logic, I would be of too much help, but all of the others, I'm fairly good at. My specialties are LAP, FAP, SAP, Sudoku, and Hitori. Status: offline I should clarify, anyone wanting help on ANY puzzle should feel free to email me along with razor and anyone else. Send all of your problem puzzles to us and we'll do our best to help. Status: offline Emailing might help the person asking, but I've also learned lots by following threads where people proposed different techniques to a solution. Emailing might help the person asking, but I've also learned lots by following threads where people proposed different techniques to a solution.